In Math, I feel repetition, reflection, and thinking about their own thinking is extremely important. I think they need a constant spiral of the concepts we want them to master. I LOVE my kids and I LOVE Math, so I hope that shines through this product. You may use this product in many different ways, but I will tell you how I plan to use it to give you an idea. Every morning my kids have jobs to do when they first get here. The morning can be a crazy time with them going to breakfast, settling in, ordering lunch, etc. These jobs get them in the groove pretty quickly. 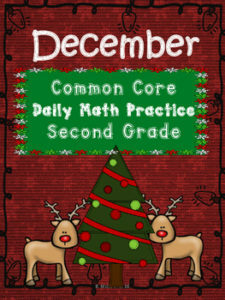 One of their jobs in the morning will be to get out their Common Core Math Journals. I put the whole month in a 3 ring binder. In the morning they flip to the page they need to do for that day. When we have done all the days in that month, I pull it out, staple it and send it home. Then, I’ll put the next month in. I’ve been to a few workshops on Math that really stress the importance of reflection after a lesson. So, that’s why I included the bottom part. My kiddos do the top part in the morning and then after Math is done, they pull out their Math journals and write in their reflection for the day. I don’t know if it’s the top part or the reflection part, or a combo of both, but my kids are better at Math and retaining information better than EVER! I hope you see this to through the use of this product!